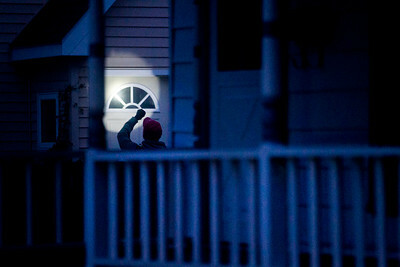 Kyle Grillot - kgrillot@shawmedia.com A U.S. Marshall shines his flashlight into the door of a suspect's home on Hoy Avenue in Woodstock Thursday September 26, 2013. 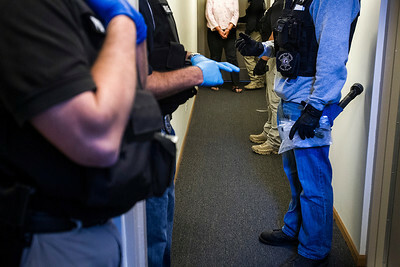 At least 35 officers from Woodstock, Lake in the Hills, McHenry Sheriffs department, and the U.S. Marshall's Great Lakes Regional Fugitive Task Force went to 20 different locations around McHenry county Thursday morning to arrest suspects with drug-related felony warrants. These types of criminal roundups are clustered together in order to use these resources in a cost effective manner. Today, 16 of the 20 warrants ended in arrests, and at least 10 will now have additional charges based on the recovery of paraphernalia and other charges. Kyle Grillot - kgrillot@shawmedia.com A U.S. Marshall shines his flashlight into the door of a home on Hoy Avenue in Woodstock Thursday September 26, 2013. At least 35 officers from Woodstock, Lake in the Hills, McHenry Sheriffs department, and the U.S. Marshall's Great Lakes Regional Fugitive Task Force went to 20 different locations around McHenry county Thursday morning to arrest suspects with drug-related felony warrants. These types of criminal roundups are clustered together in order to use these resources in a cost effective manner. Today, 16 of the 20 warrants ended in arrests, and at least 10 will now have additional charges based on the recovery of paraphernalia and other charges. 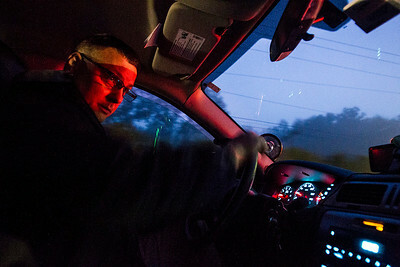 Kyle Grillot - kgrillot@shawmedia.com Lieutenant Jim Wagner turns a corner en route to a suspects home in Woodstock Thursday September 26, 2013. Roundups like these are usually done early in the morning to avoid any extra complications during the arrest such as intoxication, or absence from the home. 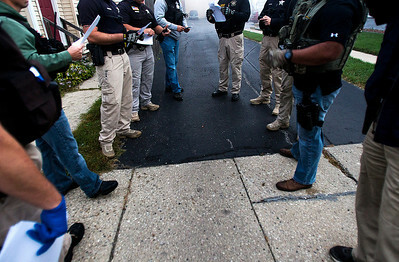 At least 35 officers from Woodstock, Lake in the Hills, McHenry Sheriffs department, and the U.S. Marshall's Great Lakes Regional Fugitive Task Force went to 20 different locations around McHenry county Thursday morning to arrest suspects with drug-related felony warrants. These types of criminal roundups are clustered together in order to use these resources in a cost effective manner. Today, 16 of the 20 warrants ended in arrests, and at least 10 will now have additional charges based on the recovery of paraphernalia and other charges. Kyle Grillot - kgrillot@shawmedia.com A Woodstock police officer transports a felony suspect to the McHenry County Adult Correctional Facility Thursday September 26, 2013. Most cars used to make the arrests like these are unmarked, and a special car is used to transport suspects to jail. At least 35 officers from Woodstock, Lake in the Hills, McHenry Sheriffs department, and the U.S. Marshall's Great Lakes Regional Fugitive Task Force went to 20 different locations around McHenry county Thursday morning to arrest suspects with drug-related felony warrants. These types of criminal roundups are clustered together in order to use these resources in a cost effective manner. Today, 16 of the 20 warrants ended in arrests, and at least 10 will now have additional charges based on the recovery of paraphernalia and other charges. Kyle Grillot - kgrillot@shawmedia.com Just after 5 a.m., police gather to listen to a U.S. Marshall's debriefing Thursday September 26, 2013. A large amount of man-power is required for an operation like the roundup that takes place soon after the debriefing. For the safety of the officers, some of whom work undercover, their faces are kept out of the images. At least 35 officers from Woodstock, Lake in the Hills, McHenry Sheriffs department, and the U.S. Marshall's Great Lakes Regional Fugitive Task Force went to 20 different locations around McHenry county Thursday morning to arrest suspects with drug-related felony warrants. These types of criminal roundups are clustered together in order to use these resources in a cost effective manner. Today, 16 of the 20 warrants ended in arrests, and at least 10 will now have additional charges based on the recovery of paraphernalia and other charges. Kyle Grillot - kgrillot@shawmedia.com Just after 5 a.m., Police gather in the parking lot of the McHenry County Sheriff's Office before going out into McHenry County. Three teams will then head to different regions of McHenry County; one team will then go to the Algonquin, Lake in the Hills, Crystal Lake, Cary region, one team will go to Hebron, unincorporated Woodstock, and McHenry, and the third team will go to various locations in Woodstock. 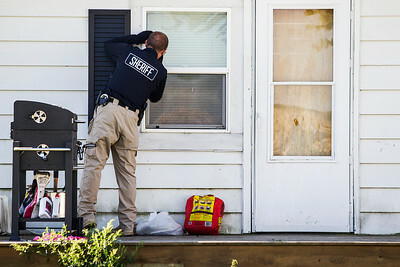 At least 35 officers from Woodstock, Lake in the Hills, McHenry Sheriffs department, and the U.S. Marshall's Great Lakes Regional Fugitive Task Force went to 20 different locations around McHenry county Thursday morning to arrest suspects with drug-related felony warrants. These types of criminal roundups are clustered together in order to use these resources in a cost effective manner. Today, 16 of the 20 warrants ended in arrests, and at least 10 will now have additional charges based on the recovery of paraphernalia and other charges. Kyle Grillot - kgrillot@shawmedia.com After consent was given to search a residence, a marijuana grow operation of approximately 50 plants was found in the basement of the farm house with an estimated $30,000 street value. As of approximately 11 a.m. on Thursday, September 26, 2013 the suspect had not been arrested. At least 35 officers from Woodstock, Lake in the Hills, McHenry Sheriffs department, and the U.S. Marshall's Great Lakes Regional Fugitive Task Force went to 20 different locations around McHenry county Thursday morning to arrest suspects with drug-related felony warrants. These types of criminal roundups are clustered together in order to use these resources in a cost effective manner. Today, 16 of the 20 warrants ended in arrests, and at least 10 will now have additional charges based on the recovery of paraphernalia and other charges. Kyle Grillot - kgrillot@shawmedia.com A friend of a suspect stands outside the home on Jackson Street in Woodstock while she is arrested Thursday September 26, 2013. If a suspect has visitors inside the home while they are arrested, the visitors are not necessarily arrested depending on their prior history and known involvement At least 35 officers from Woodstock, Lake in the Hills, McHenry Sheriffs department, and the U.S. Marshall's Great Lakes Regional Fugitive Task Force went to 20 different locations around McHenry county Thursday morning to arrest suspects with drug-related felony warrants. These types of criminal roundups are clustered together in order to use these resources in a cost effective manner. Today, 16 of the 20 warrants ended in arrests, and at least 10 will now have additional charges based on the recovery of paraphernalia and other charges. 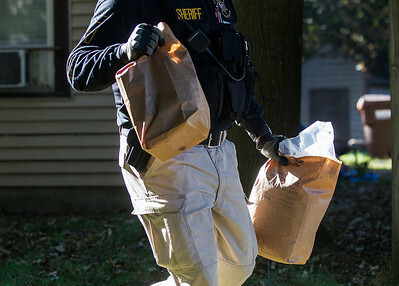 Kyle Grillot - kgrillot@shawmedia.com A police officer carries contraband to be used as evidence from a home on Jackson Street in Woodstock Thursday September 26, 2013. At least 35 officers from Woodstock, Lake in the Hills, McHenry Sheriffs department, and the U.S. Marshall's Great Lakes Regional Fugitive Task Force went to 20 different locations around McHenry county Thursday morning to arrest suspects with drug-related felony warrants. These types of criminal roundups are clustered together in order to use these resources in a cost effective manner. Today, 16 of the 20 warrants ended in arrests, and at least 10 will now have additional charges based on the recovery of paraphernalia and other charges. Kyle Grillot - kgrillot@shawmedia.com Holding recovered paraphernalia, police officers guide a suspect out of her apartment in the Willow Brooke Apartments in Woodstock Thursday September 26, 2013. 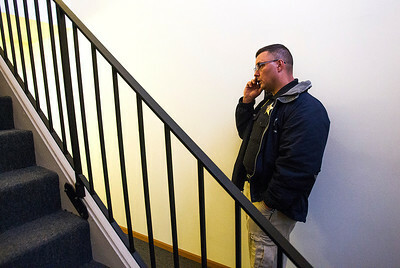 Because of various health concerns related to heroin users, officers must wear gloves, as well as other precautions, while searching a suspect's home. Some suspects have such bad cases of MRSA that roundups like these are not adequately safe for officers to make an arrest, and other actions are then required. 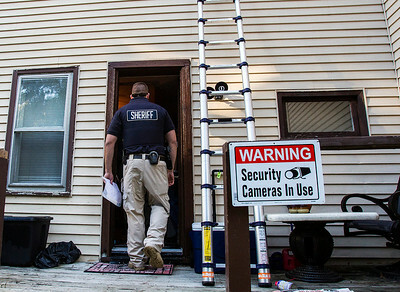 At least 35 officers from Woodstock, Lake in the Hills, McHenry Sheriffs department, and the U.S. Marshall's Great Lakes Regional Fugitive Task Force went to 20 different locations around McHenry county Thursday morning to arrest suspects with drug-related felony warrants. These types of criminal roundups are clustered together in order to use these resources in a cost effective manner. Today, 16 of the 20 warrants ended in arrests, and at least 10 will now have additional charges based on the recovery of paraphernalia and other charges. 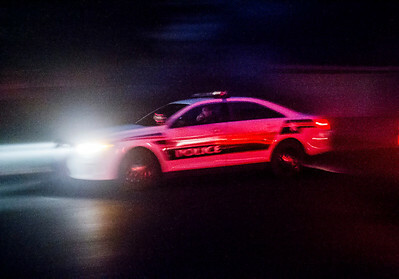 Kyle Grillot - kgrillot@shawmedia.com A suspect enters a Woodstock police car after being arrested from her apartment in the Willow Brooke Apartments in Woodstock Thursday September 26, 2013. At least 35 officers from Woodstock, Lake in the Hills, McHenry Sheriffs department, and the U.S. Marshall's Great Lakes Regional Fugitive Task Force went to 20 different locations around McHenry county Thursday morning to arrest suspects with drug-related felony warrants. These types of criminal roundups are clustered together in order to use these resources in a cost effective manner. Today, 16 of the 20 warrants ended in arrests, and at least 10 will now have additional charges based on the recovery of paraphernalia and other charges. Kyle Grillot - kgrillot@shawmedia.com Drug dealers are commonly known to install surveillance systems on their home. 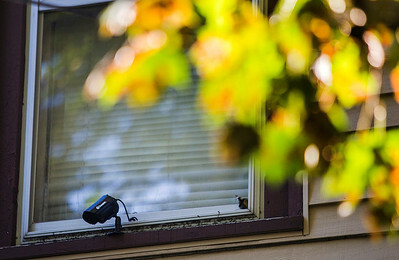 This camera is one of several seen outside a suspects home on Jackson Street in Woodstock Thursday September 26, 2013. At least 35 officers from Woodstock, Lake in the Hills, McHenry Sheriffs department, and the U.S. Marshall's Great Lakes Regional Fugitive Task Force went to 20 different locations around McHenry county Thursday morning to arrest suspects with drug-related felony warrants. These types of criminal roundups are clustered together in order to use these resources in a cost effective manner. Today, 16 of the 20 warrants ended in arrests, and at least 10 will now have additional charges based on the recovery of paraphernalia and other charges. Kyle Grillot - kgrillot@shawmedia.com Drug dealers are commonly known to install surveillance systems on their home. 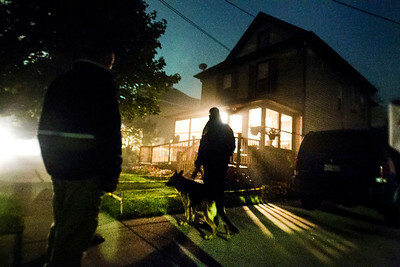 A police officer enters the suspects home on Jackson Street in Woodstock Thursday September 26, 2013. At least 35 officers from Woodstock, Lake in the Hills, McHenry Sheriffs department, and the U.S. Marshall's Great Lakes Regional Fugitive Task Force went to 20 different locations around McHenry county Thursday morning to arrest suspects with drug-related felony warrants. These types of criminal roundups are clustered together in order to use these resources in a cost effective manner. Today, 16 of the 20 warrants ended in arrests, and at least 10 will now have additional charges based on the recovery of paraphernalia and other charges. Kyle Grillot - kgrillot@shawmedia.com Police gather on Hoy Avenue in Woodstock to listen to a U.S. Marshall's debriefing after an arrest, and before moving to the next location. A debriefing takes place before every arrest to be sure that all members of the team know what the suspect looks like, as well as any other important information pertinent to the arrest. Thursday September 26, 2013. At least 35 officers from Woodstock, Lake in the Hills, McHenry Sheriffs department, and the U.S. Marshall's Great Lakes Regional Fugitive Task Force went to 20 different locations around McHenry county Thursday morning to arrest suspects with drug-related felony warrants. These types of criminal roundups are clustered together in order to use these resources in a cost effective manner. Today, 16 of the 20 warrants ended in arrests, and at least 10 will now have additional charges based on the recovery of paraphernalia and other charges. Kyle Grillot - kgrillot@shawmedia.com Lieutenant Jim Wagner receives a call from his boss, checking up on his team during the roundup in Woodstock Thursday September 26, 2013. At least 35 officers from Woodstock, Lake in the Hills, McHenry Sheriffs department, and the U.S. Marshall's Great Lakes Regional Fugitive Task Force went to 20 different locations around McHenry county Thursday morning to arrest suspects with drug-related felony warrants. These types of criminal roundups are clustered together in order to use these resources in a cost effective manner. Today, 16 of the 20 warrants ended in arrests, and at least 10 will now have additional charges based on the recovery of paraphernalia and other charges. Kyle Grillot - kgrillot@shawmedia.com Police officers arrest a man from his home on Hoy Avenue in Woodstock in the early morning of Thursday September 26, 2013. It is common for the teams to gather clothing for the suspects, and making sure they are safe before transporting them to jail. At least 35 officers from Woodstock, Lake in the Hills, McHenry Sheriffs department, and the U.S. Marshall's Great Lakes Regional Fugitive Task Force went to 20 different locations around McHenry county Thursday morning to arrest suspects with drug-related felony warrants. These types of criminal roundups are clustered together in order to use these resources in a cost effective manner. Today, 16 of the 20 warrants ended in arrests, and at least 10 will now have additional charges based on the recovery of paraphernalia and other charges. 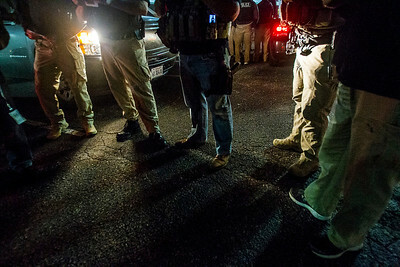 Just after 5 a.m., police gather to listen to a U.S. Marshall's debriefing Thursday September 26, 2013. 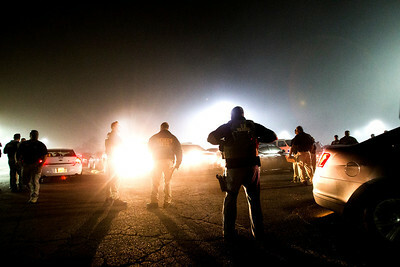 A large amount of man-power is required for an operation like the roundup that takes place soon after the debriefing. For the safety of the officers, some of whom work undercover, their faces are kept out of the images. At least 35 officers from Woodstock, Lake in the Hills, McHenry Sheriffs department, and the U.S. Marshall's Great Lakes Regional Fugitive Task Force went to 20 different locations around McHenry county Thursday morning to arrest suspects with drug-related felony warrants. These types of criminal roundups are clustered together in order to use these resources in a cost effective manner. Today, 16 of the 20 warrants ended in arrests, and at least 10 will now have additional charges based on the recovery of paraphernalia and other charges.